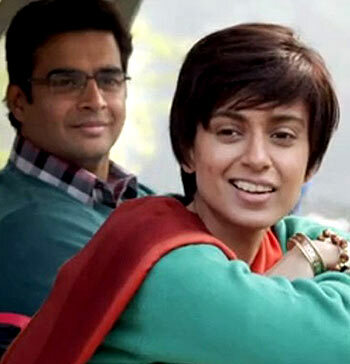 Tanu Weds Manu Returns album could have done fewer songs, says Aelina Kapoor. Fun and celebration are two moods one expects the music of Tanu Weds Manu Returns to reflect. The music is composed by Krsna Solo and Raj Shekhar is the lyricist. Since this is an Aanand L Rai film, the presentation is expected to be rustic. This is what one gets in Banno, which is the only guest composition in the film. Written by Vayu, who partners with Tanishk to recreate a folk number from the North, Banno is a celebratory song sung energetically by Brijesh Shandllya and Swati Sharma. They are both relative newcomers and do well to keep the pace and tempo high in Banno. Sunidhi Chauhan comes on next with Move On. One seldom finds such a fast paced track for a heartbreak situation, but full marks to the music team for this new experience. Move On will not really top the charts, but it is the kind of song that may play at the interval point of the film. Ankit Tiwari, an accomplished singer who is delivering one chartbuster after another, may do the same with Mat Ja Re. Krsna Solo and Raj Shekhar come up with this poignant love song which tends to linger. It has a good melody that could find many a cover version on YouTube some time from now. Newcomer Jyoti Nooran takes care of the fun element with her Haryanvi number Ghani Bawri. There is an immediate connect to the region with this desi, rustic number. It’s fun and makes an even bigger impact in the remix version. Expect Kangna Ranaut to go all out with her dance moves when this song plays on screen. But Old School Girl is more a parody of the genre, sung by a lovelorn Anmoll Mali. The lyrics suggest this one plays in some humorous situation on screen. Ditto for the ‘Haryanvi version' rendered by newcomer Kalpana Gandharv. Though this one is unlikely to become very popular, it could well work in the narrative of the film. Dev Negi, who recently crooned Coffee Peete Peete in Gabbar Is Back, sings the next number, Ho Gaya Hai Pyar. It’s a love song but uninspiring, as is O Sathi Mere sung by the usually reliable Sonu Nigam. Nigam tries to get the best out of the semi-classical tune, but it falls flat.